In response to a question to me, I have not created a 7 Point Story Structure, but have shared many of them. Here’s an amalgamation of resource links. As we move into the big annual NaNoWriMo many of us may be looking for a quick method to plan out our new work. 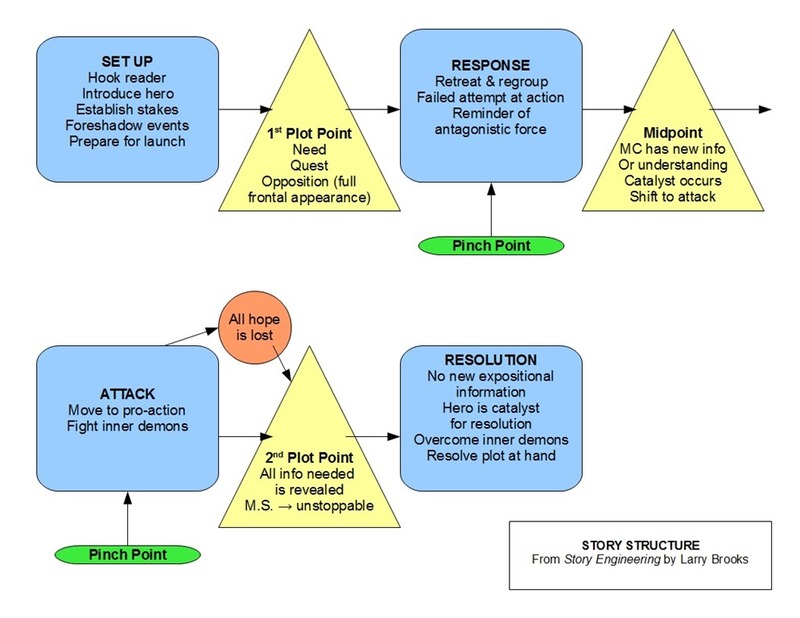 7 Points can also be defined as a Classical Story Structure, and fits with the Hero’s Journey plot points as a “lite” version quite neatly also. Horror writer Dan Wells is perhaps the King of the 7 Point Story Structure. His series of videos (five of them), openly available on Youtube, are a must-see because he explains the points so well, analysing Harry Potter, Pride & Prejudice and The Matrix alongside the points. From Well’s website, a powerpoint is also available and there is a series of blog posts on the framework also. (links below). Note that in the video presentations, Wells analyses the plot points through to character arcs with The Matrix as an example. Many others have interpreted, explained and diagrammed Well’s structure. Powerpoint of the presentation content, shared from Well’s website. Hook – this is where the story begins, it’s what your characters start out as or the situation they’re in or the actions that are happening at that moment. 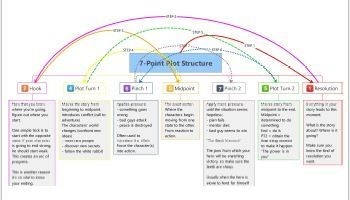 Plot Turn 1 – the part that forces the character or action to move forward. Pinch 1 – where something serious happens that really puts pressure on the character to fall irrevocably into the arch of the story. Midpoint – the point of no return, where the character makes that conscious decision to change or move forward on their own (this is where we transition from the Hook to the Resolution). Pinch 2 – the point where the story really dips and something extreme happens (the mentor is lost, the friends disappear, the protagonist is left alone and in dire straights). 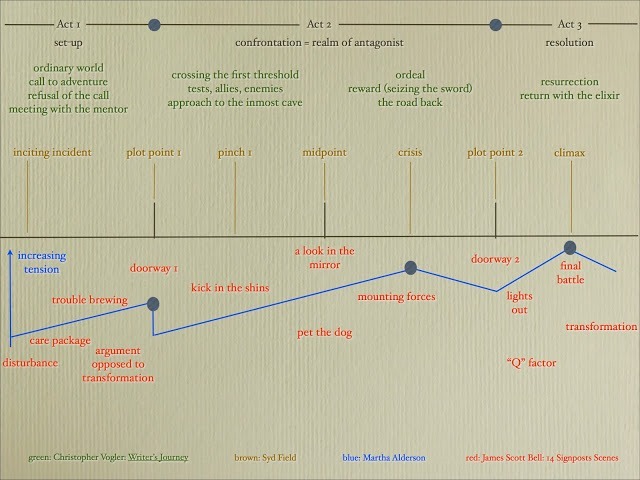 Plot Turn 2 – this is where the story reveals the tools or secrets needed to triumph (the climax of the arc). Resolution – the story has concluded and we find ourselves in an opposite state from the initial Hook. Belinda Crawford has a few blog posts on using Dan Well’s 7 Point Story Structure, which she also put into a spreadsheet she called the Pantser’s Beat Sheet. On the below post, she talks about revising her own work against this sheet, she links to some posts, and she provides an Excel Spreadsheet with the 7 Points. The sheet is in two different versions – the first has the 7 Points, while V2 has the addition of a theme column. If you subscribe to Jason Hall’s Writers to Authors email newsletter you are offered a download link which provides access to 5 different small ebooks or documents. 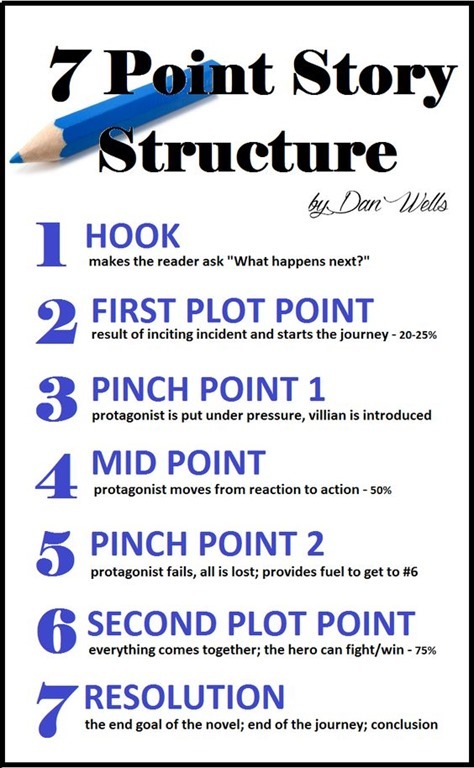 One is the 7 Point Story Structure Quick Guide, a 5-page check-list explaining each point (via Dan Wells). Or you can read each step through the posts. Link: Writers to Authors – How to Outline your Novel – Seven Point Story Structure. Note that these points are very similar to that found in Image 4 below, available as a PDF by Novel Software. Budry also suggests that in longer fiction, the try-fail cycle should be repeated three times before hitting the climax. Image 7 below shows an amalgamation of Dan Well’s 7 points as try/fails. 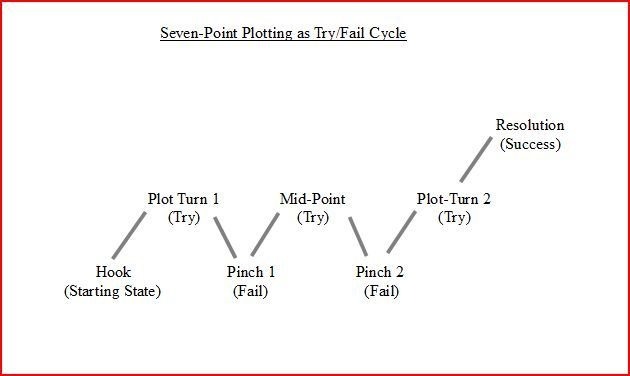 Screenwriter John Truby also has a “Seven Basic Steps of Human Action” which can form points for plot. These are mentioned in the above article. Brooks, in his many writing craft books, talks about 7 Key Milestone Moments, documented in the below graph. 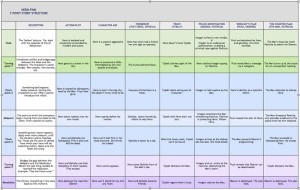 Jami Gold shares several story arc beat sheets in excel format, including one for Larry Brook’s Story Engineering structure. Julie Glover also put the structure into a more colourful chart below. Novel Software has another interesting interpretation, which can be seen as a way of using the 7 Points as useful as an elevator-pitch type summary of the entire story. This can be downloaded as a PDF from the link above. [Image 4]. This image is very similar to the 7 Point Story Structure credited to Algis Budry (see above). Daphne at The Self Publishing Toolkit also runs down Dan Well’s points, and includes a simple table template and Scrivener template to download. The post also contains all five of Well’s videos. Karen Woodward has a 2013 post series on Dan Well’s story structure. 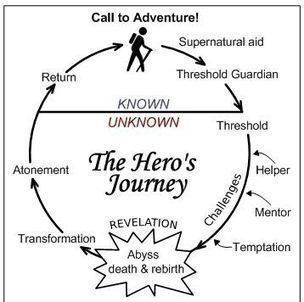 The Lite version of the Hero’s Journey takes Joseph Campbell’s story structure down from 19 (13 or 10, depending on what versions you use) points to 7. See Image 6 below. Image 4 (Elevator sentences) – diagram by Novel Software. Image 6 – Lite version of Hero’s Jouney – credit unknown. Image 8 – Julie Glover’s flowchart of Larry Brook’s Story Engineering structure, from here. Image 9 – Janet Fox’s comparison of paradigms, also available in PDF form from her website. This post is a treasure chest of resources, dealing with the hardest problem of all: how to transform the idea in your head into a compelling story.I’ve been following this Australian blog for years and am all the better for it. The blogger Hunter Emkay is a powerhouse of information on anything relating to writing. I recommend reading it and following. Thank you – yet again – for your hard work. I’ve reblogged it and also posted it on my facebook creative writing page https://www.facebook.com/creativewritingschool/ (which I don’t usually do as I like to publish different material on the two sites, but I felt this was too good to miss). I’ve also added stern recommendations to read the rest of your blog and follow! So much to take in here. Many thanks for all the hard work So generously shared! Such a wealth of information here. As I work through the 1st draft of my WIP I will be referring back to this again and again. Thank you to blogger, Hunter Emkay for such a powerful resource. Not only did I like this, I also bookmarked it on my google chrome. I totally (accidentally) followed this on my first book. Will pay closer attention on my next projects! Thanks so much for sharing this informative post. Great for all writers. 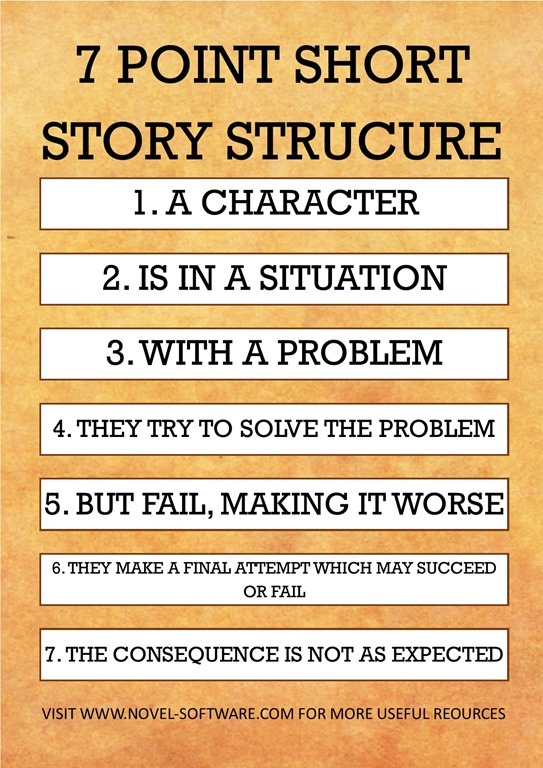 Cool, this should be a great help in structuring my own stories – when I eventually get round to writing them! Reblogging on Elemental Quill. 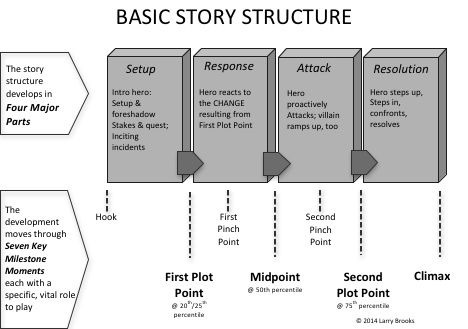 Need a guide for story structure? Thanks so much for sharing this. I’m going to explore all the links you provided.